Crater Lake Zipline is located in Klamath County Oregon. 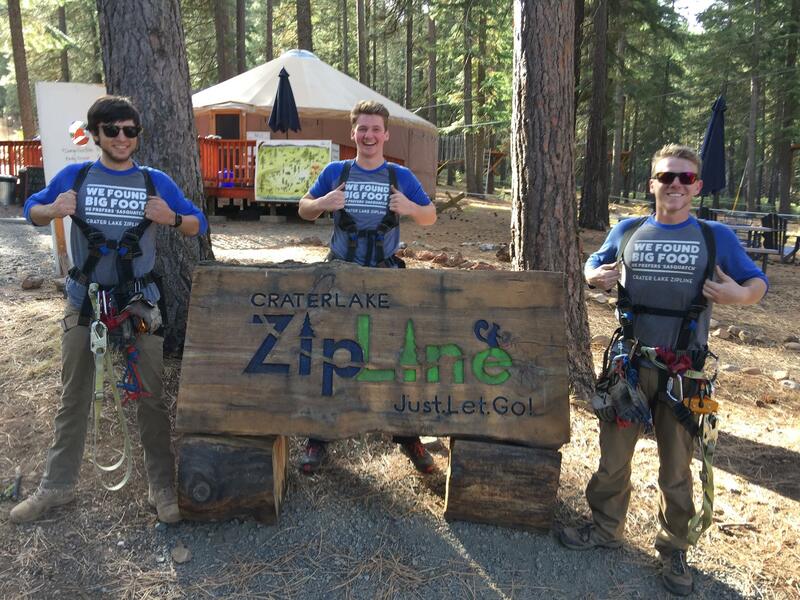 Just off the shores of the west side of Upper Klamath Lake, Crater Lake Zipline is nearly equal distance from the cities of Klamath Falls, Ashland, Medford and Crater Lake National Park. Crater Lake Zipline is a true canopy tour meaning it rests exclusively in the tree canopy of the Fremont-Winema National Forest. With 9 ziplines, two of which are over a quarter mile each, 2 controlled tree descents and two sky bridges, the course is one of the more epic canopy tours available in the United States. But, even though we’ve got a lot going on in the fun factor, what’s truly unique and special about the course are the amazing views from every zip and platform. There is just no end to the gorgeous views of Upper Klamath Lake and the Cascade Mountains. If you’re looking to work in a beautiful location that’s close to plenty of amenities, Crater Lake Zipline may be just the ticket. How old do I have to be? Zipline guides must be age 18 or older. Kids zipline guide support must be age 16 or older. Customer service and sales staff must be age 16 or older. Do you provide transportation? The company does not provide transportation to and from the work place. Do we have health benefits? We do not have a company health care benefit. Is this full-time or part-time? Full-time an part-time seasonal positions are available. Is there a uniform? Uniform shirts are required and adhering to the dress code is mandatory. Klamath County has a population of 63,775 with most of its residents located with in the county seat of Klamath Falls and its urban growth boundary. 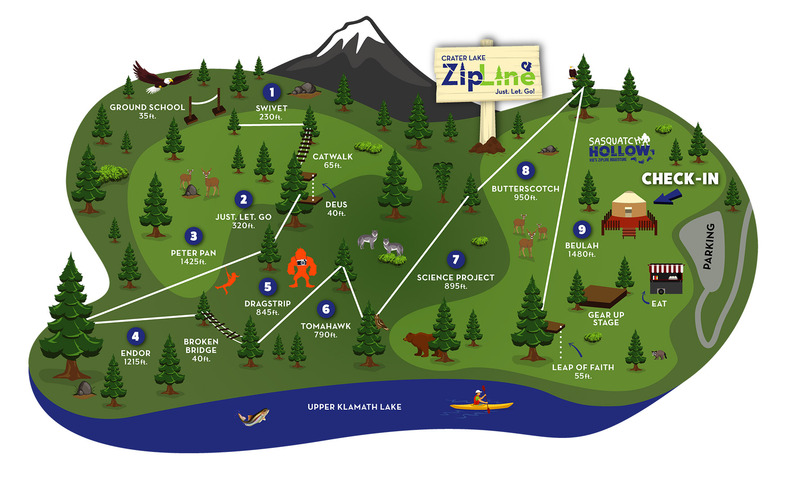 Klamath Falls is just 30 minutes from Crater Lake Zipline. Klamath Falls is classified as high desert with about 18 inches of rain annually and mild snow fall. The humidity here is low and temperatures seldom rise above 100. Its ideal weather and Klamath Falls is known as the city of sunshine! The Cost of living in Klamath County is lower than the national average. This combined with great weather plenty of restaurants, grocery stores and an abundance of outdoor recreation make it a wonderful place to spend a summer, build a career or retire. Well known rivers like Upper Klamath River, Williamson and Wood River are minutes from town. More than 82 lakes and streams can be accessed. Over 150,000 acres of wildlife refuges are set aside primarily for wildfowl. Facilities for golf, racquetball, tennis, boating, mountain biking, horseback riding, white water rafting, jet boat excursions and sailing sports keep the outdoor person involved. Winter sports feature ice-skating, cross-country and downhill skiing, snowmobiling and snowshoeing. Other diversions include Ross Ragland Theater, the Linkville Theater, the Running Y Ranch Resort, the Klamath County Fairgrounds, KLA-MO-YA Casino and of course Crater Lake National Park, the deepest lake in the United States. If you’re ready to explore the area here are a few links that you may find helpful. All reservations are charged in full at the time of booking. If you need to cancel or modify your reservation you are required to notify us 72 hours/3 days prior to your scheduled tour. Reservations are considered final 72 hours/3 days prior to your scheduled tour and are not eligible for any refund OR rescheduling. If you cancel prior to the 72 hour notification period a refund will be given minus a 10% processing fee. Sometimes, our guests decide that the course is a bit too much for them to attempt or our guides may need to make the decision that you will be unable to complete the tour and its requirements. Please understand that even though a guest chooses not to participate, does not complete the course in full, is determined unable to complete the course because they do not meet the tour requirements, they took up a slot for another paying guest. The charge is to cover scheduled guide expenses and your trip cost will NOT be refunded. Thank you in advance for your understanding. We require a minimum of four scheduled participants in order to operate a tour and cover our operation costs. If we do not meet that minimum we will notify you via email or phone at least three hours prior to your trip time of your trip cancellation. If you are unsure if your scheduled tour time has reached the minimum please do not hesitate to contact us via phone or email. If a tour is cancelled because the tour minimum is not met, participants will not be charged. All participants must be at least 10 years old and weigh between 70-250lbs. (NO EXCEPTIONS!) Guests are discreetly weighed at check-in. Those not meeting our requirements may not participate and are ineligible for a refund. Children age 10 – 15 MUST be accompanied by an adult to the tour and remain onsite. Parent/Guardian does not have to participate, but must remain onsite during tour. All children age 10 – 17 must have a parent or guardian sign their participant agreement. We suggest that you dress as if you were going for a hike. You will be wearing a helmet, full body harness and gloves so dress for comfort. The temperatures can be different at the zipline so we suggest bringing layers and making the final decision once you arrive. Long shorts or pants are best and shirts that will help keep your torso and shoulders comfortable in the harness. You must wear closed toe shoes. Tennis shoes or hiking shoes work best. Flip flops, sandals or shoes with no back are NOT allowed. If you do not have appropriate footwear you may not participate on the course and no refund will be given. Please come with appropriate shoes and clothes. Please note that we will not allow anyone to participate in TOURS who has been consuming alcohol or drugs that can impair physical and or mental capabilities. This is for your safety as well as the group’s and staff’s safety. If we believe you are or have been under the influence, we WILL NOT allow you onto the course. If this happens, you will still be responsible for charges for your reserved canopy tour slot(s). Tours can take anywhere from 2 – 4+ hours depending on the group. Please allow enough time in your schedule to enjoy the experience. Your guides will do their best to keep to a schedule but don’t want to rush folks who need a little more time to get comfortable on the course. ** Please note and understand that our staff and management have the right to refuse anyone participation rights if they do not meet the course requirements, fail to follow guide instructions or if it is deemed unsafe for them or anyone else in the group. Staff has the final say on participation.